was one of the few cases that turned out favorably. Adeline is a helpless but kindly patient of the Research Hall and a former Blood Saint of the Healing Church. You'll encounter her after entering the Floor 1 Laboratory via the connecting elevator, at which point she'll implore you to bring her Brain Fluid and offer her blood in return. Do so and she'll make good on her word, do so again and she'll show her gratitude by handling over the Balcony Key; giving you access to the Blacksky Eye. Giving her a third Brain Fluid her own, enable her to achieve an epiphany and free her from a terrible burden, at this point she will share her discovery with you and fade away in peaceful contentment. Research Hall 1F Laboratory, accessed through connected elevator, creating shortcut from 1F to upper floors. 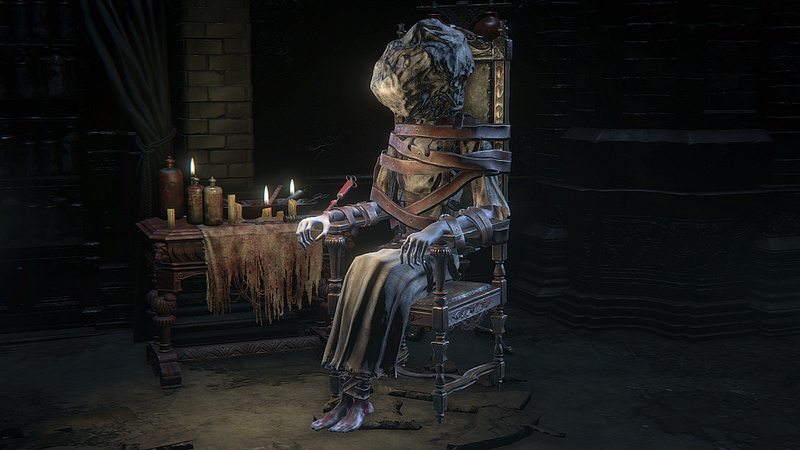 Speak to Adeline in the First Floor Laboratory and listen to her request for Brain Fluid. 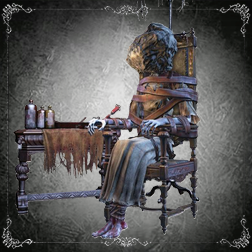 Obtain Brain Fluid from one of two NPC patients in the Research Hall; one in the Upper Rafters, and the other is on a landing between floors 3 and 4 next to Church Doctor enemy hunter armed with a Threaded Cane and a Repeating Pistol. Both of these patients are the "Head Only" type and must be attacked in order to obtain the Brain Fluid, which one you obtain and hand in makes no difference. Adeline will offer you a vial of her blood and will continue to do so each time you return when not in possession of a unique blood vial. 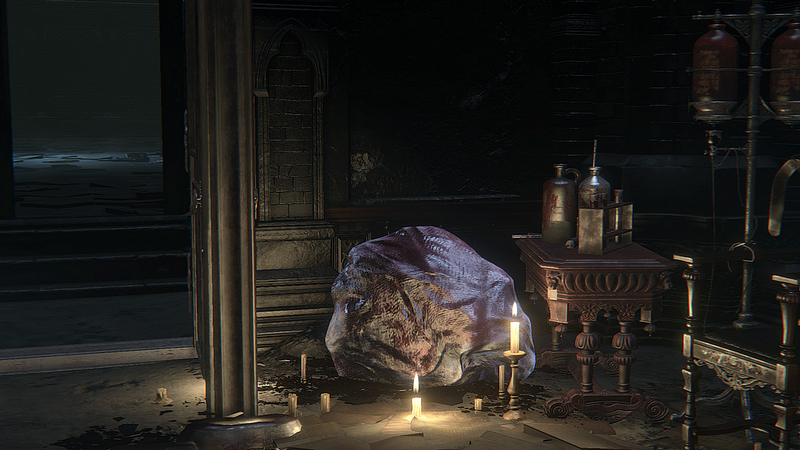 Give Adeline the other Brain Fluid obtainable from the NPC patients in the Research Hall. Note that you must leave the Research Hall and return at least three times after handing in the first Brain Fluid in order to advance to this step. After handing in the second Brain Fluid, leave and return to the Research Hall no fewer than three times. 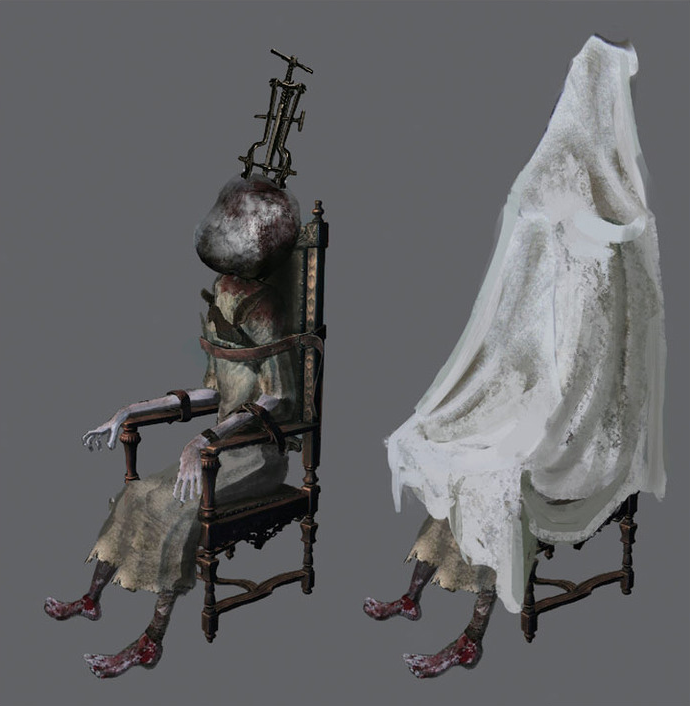 On your third return trip, Adeline will have transformed into the "Head Only" patient type and will be located immediately to the left of the entrance to the lab where you originally met her, behind the open door. Exhaust her dialogue, then attack her only once to receive the third Brain Fluid. She will immediately revive; at this point, give her the third Brain Fluid to complete her quest and obtain the Milkweed rune. Brain Fluid x1 [100%], only once when in Enlarged Head form at the end of her quest line. She will not drop Blood Dreg when Corruption Oath Caryll rune is equipped. 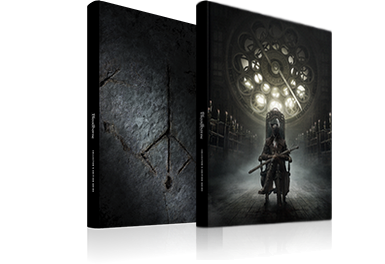 Is that you, Lady Maria? No, you're someone else. Please, could you do something for me? Oh, thank you, you're terribly kind. And, oh! I hear the sticky sound. Do you hear it, too? Oh, I know. Will you have my blood, as thanks? I'll have you know. I was once a Blood Saint, too. But I cannot move. Look, on my right arm. I'm sorry to trouble you, but you don't mind, do you? Fear the thirst for blood. I should know. I was once a Blood Saint, too. Please, somebody, I need help. Hello? Is that who I think it is? Please, oh please, I need Brain Fluid. The sticky sound is fading fast. Please, bring me Brain Fluid. Yes, that's it, let me have it! Ahh... ahh! I can hear it, yes! That sound that guides me. Thank you, thank you so much. You have saved me. other than my own blood. One last time, will you fetch Brain Fluid, just one last time? The murky, mushy fluid that will make me whole. The sticky sound whispers to me. So very close, right into my ear. My head, just a head, that's all there is. Please, give me Brain Fluid. The sticky sound whispers, I need my baptism. Ahhh! Aahh! I see a shape. My guide, I see your voice, clearly, as it bends and bleeds.